The young of a horse is a foal. As of the next calendar year, it is called a yearling. A foal is susceptible to all kinds of disease. 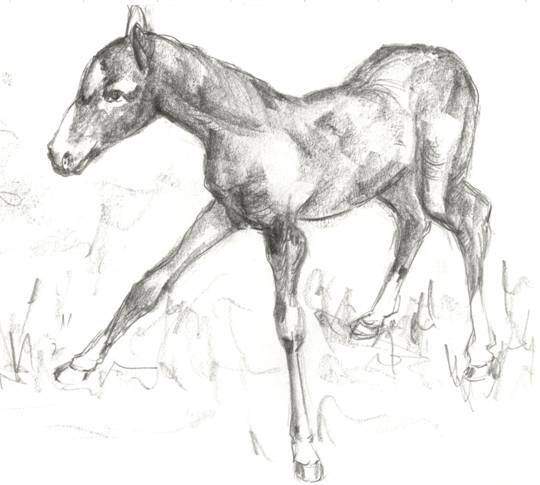 ‘Sleepy foal disease’ refers to a special infectious disease that only occurs in very young foals varying in age from a day to a few weeks old. This kind of foal disease usually turns out badly. At birth, human babies and the young of virtually all mammals already have some degree of resistance to infections. They are given the mother’s antibodies while in the uterus. Which antibodies the foetus is given and how much depends upon the permeability of the placenta (afterbirth). That differs per animal species. In humans and dogs, for example, the unborn child or puppy receives all of the mother’s antibodies. But in mares, the placenta does not allow any antibodies through: foals come into this world without any resistance to infections. Every new-born becomes contaminated with bacteria from the minute it is born. These intruders are rendered harmless by the antibodies that the new-born received from its mother. But foals do not have antibodies until after they drink the mother’s milk, the colostrum. It is rich in antibodies. The mare’s milk no longer contains antibodies after two days. New-born foals can stand up and drink the mother’s milk a mere half hour after birth. After a day and many litres of colostrum, the foal will have enough antibodies to be able to fight off infections. But they are vulnerable for pathogenic organisms, particularly during the first hours after birth. A quick way for infections to penetrate the young animals is the navel; it is still open shortly after birth. The immune system of foals does not function adequately in the first hours after birth. As a result, invading bacteria can reach the body cavities via the bloodstream. The abdominal-, chest- and cerebral cavity may become inflamed. This will prove fatal. An inflammation of the joint cavities in young foals often leads to permanent changes so that foals suffering from polyarthritis become unsuitable for equestrian sports at a later age. The more colostrum a foal has had, the less acute these early infections. They are generally spared meningitis, pleurisy and peritonitis. But joints will become affected for as long as the resistance is not at its optimum. A rapid intake of colostrum is the best way to prevent all kinds of foal diseases. The mother mare produces antibodies against the infections that are prevailing on the farm where the foal is born. If the mother does not produce any milk or dies during delivery, colostrum from some other mare on the same farm is the best alternative. A stock of frozen colostrum is a good solution for such emergency cases. Nowadays, one may also opt to buy hyper-immune serum. That is blood plasma with antibodies that is administered via a drip. It can be used in emergency situations to prevent sleepy foal disease. It is essential that the hyper-immune serum is administered before the foal falls ill and the body cavities or joints are inflamed. Another practical measure that can be taken to help prevent sleepy foal disease and other infections of the new born is an injection of antibiotics shortly after birth; known among horse breeders as ‘the foal injection’. It too must be administered before any symptoms of illness have developed, meaning to a healthy new-born foal. The foal injection should preferably be administered within eight hours after birth. That is the amount of time that invasive bacteria need in order to ‘take effect’. 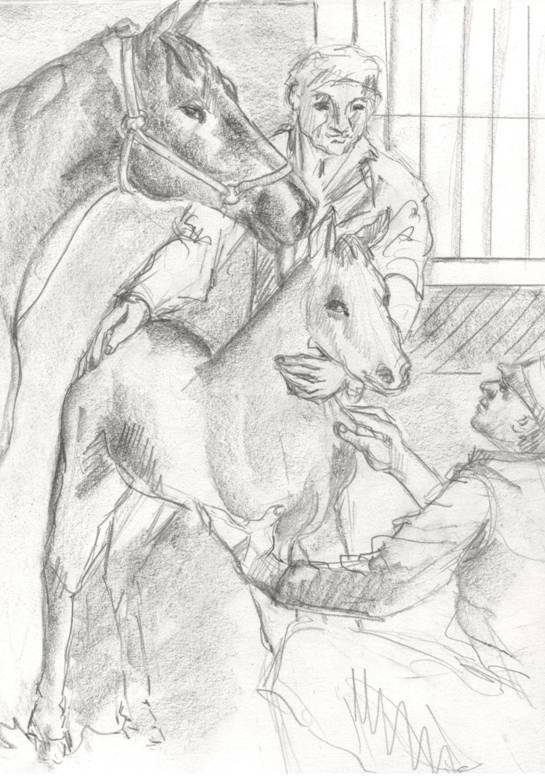 In my practise, I preventatively treated an estimated fifty foals with antibiotics every year; all in all over one thousand foals. They were actually administered two injections: a fast-acting ampicillin-preparation and a slow-acting ampicilline. Of all of these cases, things went wrong only once when the sleepy foal disease developed despite the preventative injections. In the eighties, there were only a mere ten or so cart horses still under the care of our practice. Due to the introduction of the tractor, they were no longer needed on the farm and they were hardly used for recreational purposes. Yet, at the time, there were still a few farmers who kept their work horses of former days and continued to breed them. A 1000-kg mare, however, has quite a daily appetite. And the proceeds of cart horse foals are low: the costs can be earned back with a female foal, but a male foal will not even yield the cover costs of the mare. The birth of a cart horse foal is called in during the morning office hours. The foal most probably was born the night before shortly after 1 a.m. The owner had fallen asleep briefly in his kitchen. When he returned to the stable around half past one, the foal was already born. It is my first house call of the day. The old farm is situated in a bend of the by-road. Two unmarried brothers and their two sisters live there together: all four have meanwhile passed the age of sixty-five. They still keep a few sows and a few young cattle: it keeps them busy and provides a bit of livelihood around the house. They have also kept the cart horse. They still have the mare covered each year in the spring. I proceed to the stable in my work boots. Inside, I find the mare fastened in front of the feeding-trough. The foal is lying in the corner on a bit of straw. The clinkers of the stable floor are flooded with the mare’s milk. The straw under the foal is also drenched. The mare has been producing colostrum and milk for a week now. And in no small amounts: ‘No, she pissed milk all the time'. All of the colostrum has been lost. 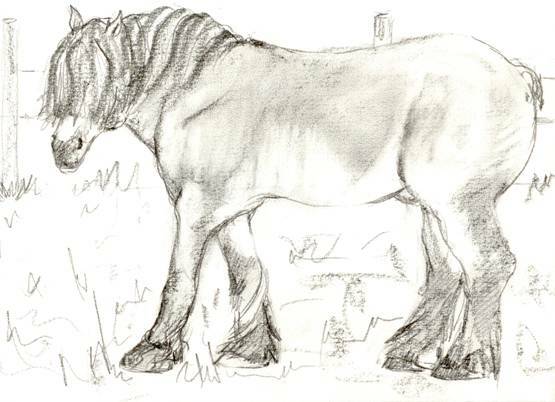 The foal did drink milk, but the milk no longer contained antibodies. Its legs are straight, the joints are not swollen. But the navel is wet. I spray it with povidone iodine. And he is given two injections with ampicillin. This foal is at great risk of developing sleepy foal disease. Frozen colostrum from previous years is not available. Hyper-immune serum does not yet exist at the time; actually, the costs of the serum would exceed the value of this male foal. Which is why I propose that we repeat the foal injection in three days’ time. This will provide some degree of protection against infections. But it does involve twice the costs; for a male foal! And what is the veterinary surgeon so worked up about: this is a healthy foal, isn’t it? I just ‘happen’ to drop by on day four. If the foal is indeed healthy, it should be jumping around and playing in the stable. This is not the case: the young stallion has difficulty standing up and moves listlessly towards the mare. After drinking a bit of milk, he immediately lies down again: he appears to be sleepwalking. His temperature and lung sounds are normal. But I have doubts concerning the hocks: they are not exactly overfilled, but rather appear to be somewhat swollen. And there is fluid beneath the skin. I again administer two ampicillin-injections. When I call later to check the situation, I am told that the foal could barely stand and no longer wanted to drink the day after my second house call. They then called a horse trader and sold the mare and the foal. That is to say: the mare was sold and the trader also most reluctantly took the foal. There was no money to be earned.